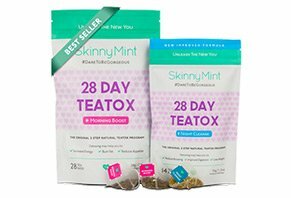 SkinnyMint Teatox Reviews - Is it a Scam or Legit? SkinnyMint Teatox’s brand of green tea-based products claim to help cleanse your body, give you all-day energy, and put you on the path to improved health. Known as the “original 2-step teatox,” SkinnyMint Teatox is a green tea-based system that’s claimed to increase energy, naturally cleanse and rejuvenate your body, kickstart your healthy lifestyle, and help you achieve your health goals. In order to accomplish this, SkinnyMint claims their Teatox is the result of “extensive scientific research” with 100% natural and organic ingredients that help boost your metabolism, flush out toxins, reduce bloating, and burn fat, all without dieting or popping pills. Even if you’re not exactly a fan of tea, you’d almost certainly make an exception with SkinnyMint Teatox, especially if it helps you become healthier and get into ideal shape. But is this what you can expect? Are detoxes even necessary in the first place? We’ll cover all the important facts shortly, but let’s first learn more about each of Teatox’s formulations. According to SkinnyMint, not only are their Teatox blends proprietary, but they’re also specifically designed with ingredients that complement one another. In other words, the company claims they’re more potent together than they would be individually. Let’s take a closer look at what each of these blend contains, and then we’ll talk about their effectiveness. SkinnyMint claims their Morning Boost is a sweet, fruity, and fragrant blend that’s uniquely formulated to boost energy all throughout the day, while also controlling appetite. This includes 8 “super ingredients,” such as green tea, yerba mate, nettle leaves, dandelion, guarana fruit, grapefruit leaves, strawberries, and pineapples. Morning Boost is promoted as an ideal replacement for your morning coffee, and might be able to help you avoid sugary drinks and energy beverages by offering a natural, healthy pick me up. Night Cleanse is SkinnyMint’s caffeine-free blend that’s claimed to naturally detox the body, help it absorb nutrients better, and maximize the results of your teatox. This is accomplished using calming ingredients such as ginger root, orange leaves, lemongrass, senna leaves, peppermint, licorice root, hawthorn berries, and psyllium husk. According to the company, Night Cleanse should only be taken every other night, although if you’re used to the teatoxing process, it can be taken nightly. In either instance though, do not drink the Night Cleanse blend for more than 14 nights per month. Now that we’ve covered the basics of each Teatox blend, let’s find out whether or not their ingredients are effective. Are SkinnyMint Teatox’s Ingredients Effective? The quick answer: There is insufficient clinical evidence showing that green tea, yerba mate, nettle leaves, dandelion, guarana fruit, ginger root, hawthorn berries, can provide any of the benefits claimed by Teatox’s manufacturer (most other ingredients are included for flavor, not effect). On the other hand, senna leaves and psyllium are listed as possibly effective for reducing constipation (more about this shortly), as is ginger for reducing menstrual pain. The detailed answer: This depends on what you mean by “effective,” which largely depends on your expectations. Why? Because if you read through the SkinnyMint website, view their customer’s before and after pictures, or even just base your opinion on the company’s name, you might reasonably believe that 1) these Teatoxes help you lose weight (or at least inches), and 2) that they help cleanse your body of toxins that might reduce your overall level of health. However, as we noted above, there isn’t enough clinical evidence showing that SkinnyMint’s Teatoxes can help you lose weight. But what about inches? We’ll explore this in the next section. Does Your Body Require Detoxification? Alright, so you might be a little bummed that Teatox’s ingredients probably won’t work as well as the manufacturer might make it seem. But does your body need to be detoxified in the first place? There is absolutely no scientific evidence that our body needs to fast or detox in order to cleanse itself from toxins,” says Heather Mangieri, RD, CSSD, a spokeswoman for the Academy of Nutrition and Dietetics. “These diets are so popular because they feed off the fear that our environment is full of chemicals, and therefore detoxes are necessary. But our bodies have their own built-in defense system—such as our lungs, liver, kidney, and gastrointestinal tract—to help eliminate toxins. With this in mind, instead of actually “cleansing” your body, the senna leaves and psyllium husk contained in Teatox might provide a mild laxative effect. In turn, this can possibly provide a temporarily slimmer tummy due to lost water weight, although this effect will return as soon as you replenish your fluids. In short, SkinnyMint Teatox won’t cleanse you, but it might help keep you regular. For more about this topic, be sure to read Colon Cleanse & Detoxification Supplements May Not Be What They Seem and Can Drinking Green Tea Really Help You Detox & Lose Weight? Although Teatox’s ingredients won’t really cleanse or provide weight loss benefits—essentially providing you only with a tasty tea sipping experience, is there anything you should be concerned about? Are There Any Dangers Related to SkinnyMint’s Teatoxes? Outside of the caffeine naturally present in green tea, which might be a concern for those sensitive to stimulants, most of Teatox’s ingredients come with very few side effects. However, senna can lead to gassiness, cramps, and nausea. With extended use, this can lead to potassium and electrolyte depletion, dehydration, and more. Is this what SkinnyMint’s customers have experienced though? We’ll find out next. Because London-based SkinnyMint has been around for a few years, you might assume there are plenty of online customer reviews you can use to make a more informed decision. However, this wasn’t the case at the time of our research. DietPillsWatchdog wrote a fairly in-depth review about Teatox, and concluded by saying that, “We can’t really see this teatox doing much for your health or weight loss,” which is unsurprising considering everything we learned above. Outside of this, the only reviews were from independent bloggers who received free SkinnyMint products in exchange for an honest review, and most were only surface-level and not very detailed. However, we’ve reviewed many of the most popular “teatoxes” here at HighYa, which contain similar formulations to SkinnyMint’s. Among nearly 50 reader reviews for these products (as of 7/21/15), they had an average rating of 2 stars, with common complaints citing failure to provide any benefits, high price, and poor taste. From a company perspective, SkinnyMint Teatoxes are manufactured by Bodyboost Pty Ltd, although the company wasn’t listed with the Better Business Bureau and no additional information was available online. Regardless of the option you choose, your Teatox order will come with free worldwide delivery, as well as a 60-day refund policy, including return S&H charges. However, keep in mind this only applies to unopened product in its original packaging. If you’re based in the US and would like to process a refund, you’ll need to contact SkinnyMint’s customer service department at 347-602-4551. Is SkinnyMint Teatox Worth the Money? All in all, this largely depends on your expectations. In other words, are you expecting to kickstart the “new you” by ridding your body of toxins, shedding a few excess pounds, and shrinking your waistline? If so, it’s our opinion that you’ll likely be disappointed with SkinnyMint’s Teatox—at least without also sticking to a healthy diet and exercising regularly. On the other hand, are you a tea aficionado who’s looking to try out a new, tasty blend, while temporarily increasing your regularity? In this case, you might find Teatox’s relatively high prices worthwhile. With all of this in mind, it seems like SkinnyMint is a legitimate company who stands behind their Teatox products, although this doesn’t mean that they’re effective—or that you’ll necessarily find that they provide a solid value for the money. I absolutely love the taste...add a little bit of honey and lemon and I'm off to a great start. The tea provides me with some form of energy (compared to just drinking a regular caffeinated tea) and I've seen an improvement in bloating, and I bloat a lot normally, and not craving as many sweets or being as hungry. Keeps me regular and able to go if I'm not able to as well! This product helps with a bloating feeling that I have, even though I eat fairly healthy, I still feel bloated. After a week or so of this tea, I notice a HUGE difference. And it tastes great! It doesn’t taste bitter or nasty or anything, it tastes refreshing! Love this product. Like the taste of both morning boost and night cleanse. Quick delivery. Not sure about the whole detox thing but certainly didn’t put up weight. Be careful with the night cleanse. It works. I personally was happy with the results of my Teatox. I’m not a big tea drinker so I definitely had to get used to the taste. The Night Cleanse tea did cause a little bit of cramping in the morning, but this went away over time. Like most Teatox programs, clean eating and exercise are needed in order to see results. I really noticed a difference in the flatness of my stomach. I did also notice much better results when I used their fat burning gummies (which I think taste great) in conjunction with the tea. I did find that if I went back to my old eating habits, yes I did gain some of the weight back (which is expected). I do live in Canada and have noticed that their prices now only show in USD. With our dollar being what it is, it is definitely too expensive for me to do often. That being said, they do offer BOGO programs, discounts on bundles of products or percentages off. As I said before, if you are eating poorly and expecting drastic results while taking this tea, then maybe this product isn’t for you. If you are looking for a product to help boost your lifestyle change than in my opinion, it does work. I will be purchasing it again in the future. I will start by thanking the makers of SkinnyMint Night Cleanse for creating a product that not only does what it says it will, in my opinion - it is better than what I expected. I have used SkinnyMint teas for more than a year and a half, and I always make sure that no matter what, I have Night Cleanse in my home, ready to use. What the Night Cleanse does for me is enable me to flatten my stomach for a stress-free and fun beach weekend, or avoid that "I hate myself for over-indulging last night" feeling. The Night Cleanse has never upset my stomach, doesn’t cause bloating (like a laxative would) and gives me a good feeling of, "Ok I can start being more mindful of what I’m putting in my body for nourishment" or knowing that I look better in my clothes because they are a little bit less sung, and in some cases, loose! Overall, SkinnyMint Night Cleanse is my favorite product from SkinnyMint. I am 100% satisfied with Night Cleanse, and will continue to be a very loyal customer. I have used SkinnyMint Morning Boost, and honestly, I am more of a coffee person. The Morning Boost, in my opinion, does not have the taste I would need to make me "love" it. Also, it doesn’t have the amount of caffeine I prefer. I like the original gummies better than the new ones. I wish they were an option now. The new gummies taste good, but I prefer the original. What the gummies did for me was keep me mindful of what my goals are/were. When I took them, it was a reminder that I want to look good, feel good and put nutrient dense food in my body and avoid junk and processed snacks. I love the new coffee packets. However, I use them a little differently than SkinnyMint’s suggested use. I add the packet to the coffee I make at home. It has helped me avoid using harmful artificial sweeteners. I think the coffee packets are not strong enough to use by themselves, but I will continue buying the product because I like it in my morning coffee. I have not yet tried the Hot Chocolate, but I’m not really interested. I love SkinnyMint. You have a forever customer in me! Thanks for the opportunity to write a review. I go back to SkinnyMint Teatox every time I need to get rid of stomach bloat. Within days my belly flattens again, I have more energy to workout and I feel amazing! I really enjoy the taste of both the AM and PM teas. When I add the fat burning gummies to the mix, I feel maximum results! I absolutely love the product! It, along with regular exercise, helped me shed those tricky last couple of pounds. My only recommendation is that you make your website a little easier to use. In the past, I’ve wanted to buy a specific product, but because it wasn’t the one being promoted that particular point in time, it was really hard to purchase what I wanted rather than the website trying to make my deduction for me. I love the Teatox. I have been drinking the morning teas for a long time now and love the taste of them. I was a little disappointed to find out you can no longer buy the morning ones on their own, because you have to have a break on the evening ones so I like to carry on with just the morning ones, but now I can’t buy them separately. I don’t know how much longer I’m going to keep buying them for, so on the lookout for something as good then may try them. I have been using SkinnyMint for a year now. The products are tasty and easy to use. Deliveries are always quick and are reasonably priced compared to other weight loss assisting products. I have recently tried the coffee, which is very nice, but have yet to try the hot chocolate. I can’t say I have lost weight with these products because I don’t use them every day but still love them. Took my money and didn’t provide the product! I ordered the 28-day Teatox cleanse when it was on sale for buy one get one free. I only bought this product because of the amazing deal they had. They only sent me one month's worth instead of the two that I had paid for! When I emailed them they refused to cooperate and will not provide me with the rash of my order! Terrible dodgy company! Don’t waste your money! I gave two stars because they shipped fast. Beyond that, I was not pleased. I bought the day and night 28-day detox combo on Amazon after seeing their ads all over the place. The ads and website all boast about faster metabolism and more energy. I know that a Teatox can't be a miracle, but I was hoping it try something new to slim down a bit. Well, let me just say, I would not recommend the product. The brand looks all bright and fun, but the product was awful. For one, I did NOT like the taste of either the day or night tea. I tried it with lemon and honey, but it didn't mask the low-quality taste. I'm a tea drinker and even Lipton, but this was NOT good. Second, I actually gained two pounds in two weeks after drinking this tea. I eat okay so I thought It would take so something, nope. The only thing I lost was the money I spent! Third, and what I've seen other reviewers say too, is that it makes my stomach feel awful some days! It seems it really did depend on if I had food in my stomach already, but I don't trust a Teatox that makes my stomach knot up. I hope this helps, avoid this if you can! I'm sure there's a better detox or something out there. Write a Review for SkinnyMint Teatox!